The RV50 is an industrial 4G LTE cellular gateway that provides serial and Ethernet connectivity to numerous cellular networks. (The RV50 automatically falls back to 3G or 2G when 4G coverage is not available.) The RV50 is capable of LTE, CDMA/EV-DO, and GSM/GPRS/EDGE/WCDMA networking and is carrier-approved worldwide for Verizon, AT&T, T-Mobile USA, Rogers, Bell, Telus, and other cellular data carriers. The networking and carrier used by the RV50 are determined by the active SIM card(s) inserted into the device. Note: The RV50 does not ship with a SIM card unless the cellular modem was provisioned with/for Cellular Data Services; the SIM card is provided by the carrier when signing up for service. Warning: To use the RV50 on the Verizon network, the user's cellular account needs to be set up with a public, static IP address. There is a one-time set-up fee for the account holder, regardless of the number of devices that are activated. As of February 2016, this fee is $500 USD. For Our International Customers: Campbell Scientific recommends checking with your network provider to verify the type of IP address and frequency provided. The RV50 should be used to expand/replace existing RV50 networks or for Ethernet functionality. For other or newer applications, Campbell Scientific recommends using the CELL205, CELL210, CELL215, or CELL220 instead. The RV50 is an industrial 4G LTE cellular gateway. It requires at least one mini-SIM (2FF) card supplied by your cellular carrier and a suitable 12 or 24 Vdc nominal power source. The RV50 has an RS-232 serial port that can be used for serial server, serial client, and PPP host services. This port is commonly connected to a data logger RS-232 serial port. Additionally, it has an Ethernet port, as well as a host of Ethernet and IP services related to routing, port forwarding, VPN, and more. The RV50 has three antenna connectors to be used for primary and diversity antennas and GPS, although the unit can operate with only the primary cellular antenna connected. The RV50 provides Internet connectivity to any Campbell Scientific data loggers located within range of a compatible cellular network. Armed with Internet connectivity, a data logger can remotely connect to Campbell Scientific software on a PC, mobile device, and the cloud. The RV50 can also enable many data loggers to communicate using other Internet protocols, such as Modbus, DNP3, email, and web (HTTP). The RV50 is powered by the Sierra Wireless ALEOS embedded operating system. This allows the RV50 to provide highly reliable connectivity and remote device management independent of the device it is connected to. The numerous embedded services include IP serial server and client, local PPP host, dynamic DNS client, routing, VPN, and more. Campbell Scientific offers low-cost, cellular data service plans for the RV50. Our data service plans include Verizon in the United States and AT&T in North America (US, Mexico, Canada), as well as international access to over 600 carriers in 185 countries. The Konect Router Service is included to assure a secure connection with Campbell Scientific data logger support software. The RV50 is configured using ACEManager, a web-based configuration tool hosted by the gateway. ACEManager can be accessed using Internet Explorer or Firefox remotely over the cellular WAN or locally over Ethernet. A number of templates will be provided for download to make most configurations very simple after connection to ACEManager. Data loggers can be connected in a variety of ways to suit the needs of the application. Common methods include the use of serial or Ethernet peripherals. The 28899 Ethernet cable is shipped with the RV50 for connecting Ethernet devices. Compared to many other industrial cellular gateways, the RV50 has a very low power consumption. The average current consumption at 12 Vdc is about 65 to 95 mA when idle, depending on its configuration. Additionally, the RV50 can be turned on and off easily using a data logger C, U, or SW12V port. When using the SW12V terminal, the modem can typically be powered with a BP12 battery, a CH150 charger/regulator, and a SP10 solar panel. Campbell Scientific offers three antennas for the RV50. Our 4G/3G/2G 0 dBd cellular dipole whip antenna (pn 32256) connects directly to the RV50 (no cable required) and can transmit short distances. Our higher gain omnidirectional (pn 18285) and Yagi (pn 31128) antennas require a cable to connect them to the RV50. The COAXSMA-L cable connects the antennas directly to the RV50 cellular antenna connector. The COAXNTN-L cable and a surge protector (pn 31317) are used when the RV50 is susceptible to lightning or electrostatic buildup or for long cable runs. Ask your cellular provider for an M2M (machine-to-machine) account sales expert for the purpose of setting up either a publicly available static or dynamic IP account. You will need the sales expert to provide a mini-SIM card provisioned for your account. The RV50 is configured using ACEManager, a web-based configuration tool hosted by the gateway. ACEManager can be accessed using Internet Explorer or Firefox remotely over the cellular WAN or locally over Ethernet. A number of templates will be provided via download to make most configurations very simple after connecting to ACEManager. For use with the Sierra Wireless RV50 modem. 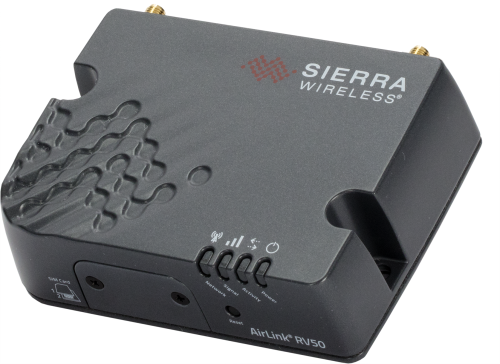 These template files are used with the Sierra Wireless ACEManager to configure the AirLink RV50 modem to communicate at 115200 or 9600 baud with the datalogger. The templates will configure the RV50 for both serial server or PPP (point-to-point protocol) with the mode being determined by the datalogger. Using PPP allows access to the dataloggers IP capabilities (Email, HTTP, FTP, etc). The CR300, CR800, CR1000, CR3000 and CR6 dataloggers supports PPP. Port forwarding for ports 80 and 6785 (HTTP and PakBus) is included in the template. Other needed ports (i.e. for Modbus and DNP3) will need to be added by the user through the RV50 ACEmanager interface.